Ohler, however, saw little action in his first two years as he was the backup to the great Joe Kapp. Ohler actually became a Winnipeg Blue Bomber for a short time as he was claimed by the Bombers in an equalization draft, but the Lions reaquired Ohler in a trade in October as they gave up Wayne Dennis and an American tackle to Winnipeg. Ohler did see some action also as a defensive back and as a punt returner. The Lions went to the Grey Cup both years. The Lions lost in 1963, the year of the infamous Angela Mosca hit on BC star running back Willie Fleming. 1964 was a rematch, and this time the Lions got their revenge and the first Grey Cupu in franchise history. 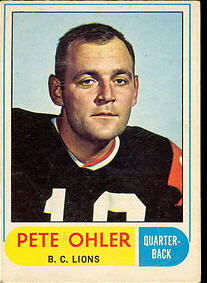 Ohler did more than just sit on the bench in the 1964 Grey Cup as he threw the winning toudhdown pass. It was on a botched field goal, and Ohler picked up the ball and threw a touchdown pass to tight end Jim Carphin. After not playing in 1965 and 1966, Ohler returned to the Lioins in 1967. Ohler didn't see much more action in 1967, but with the departure of Kapp, Ohler got his most action in 1968 when he had 153 jpass attempts and 1037 yards passing. Ohler finished his CFL career with the Lions in 1969. Following his playing career, Ohler embarked on a long coaching career at various levels in BC, including with the UBC Thunderbirds.